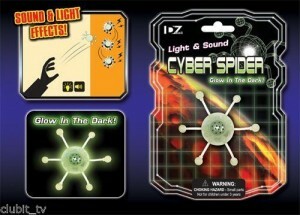 The Cyber Spider is a cool pocket money toy that glows in the dark and makes the sound of smashing glass when thrown about. The light and sound Cyber Spider toy can be thrown on to any smooth vertical surface such as mirrors, windows, gloss painted doors, fridges and cupboards and it will slowly tumble down making the sound of smashing glass with every step! The Cyber Spider toy is available to buy from Clubit.co.uk and makes a great stocking filler gift and perfect for kids party bags.